Hello Everyone, Jo here today with my take on the White + 1. My colors are White and Plum. I decided to go with making a bookmarker. I felt this quote was very appropriate. Because books really can take you away. I thought Asian Gilli was perfect for this. Some little girl is reading a book on a young girl traveling all around. 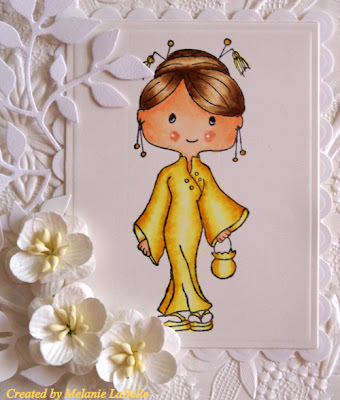 She is colored with my Copics and a little stickles has been added to here dress. I hope that you will join us for our challenge this week. We would love to see your take on our White + 1 challenge. Skin and hair colors do not need to be part of the plus one. If you have a Gilli stamp we would love to see it but if not that’s fine too. Thanks for stopping by today. Hope to see you in the challenge. This challenge is great fun, and I hope we see lots of entries! To join our challenge your card should be white with one other color. 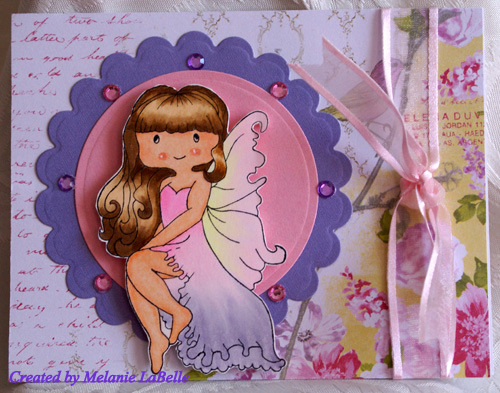 My card is made using Spa Gilli, which I colored with Copics. Doesn't she make you want to relax at a spa?! Now I had to use my favorite Gilli - Asian for this challenge, isn't she the best :) I just adore her. She is colored with Copics to make her look orangery-yellow, which I think looks great with the white. My DP paper is something I have had for a while and it came embossed already, I couldn't resist using it. So, I hope you will stop by and join in, I cannot wait to see your creations. For today's card I colored Fairy Gilli 2 with my copics using the feathering technique on her dress and wings. My background paper is new and it is by Prima - Meadow Lark and it is so beautiful, I love the whole pack lol. Make sure to stop by every couple of days, the DT has some really wonderful inspiration. Cozy Gilli has her Spring Snuggi on! First let me apologize for my late post today. Things got crazy hectic all of a sudden at my house and taking a picture of my card and posting completely slipped my head. When it rains it pours...and in this case it was literally. Yep it started raining in my living room in my brand new home- the shower in my bedroom apparently leaked and it came through the ceiling. So I hope you can understand why pretty much everything else left my mind lol!!! Thankfully the builder has been called and she will get it fixed and the damage repaired. On to my card. My fave Gilli is Cozy Gilli due to my daughters love of their Snuggi's. Yep they both have one and they even bought each other theirs as their mom refused to buy it hee hee! I love seeing them all snuggled in with it watching tv late at night or early Saturday mornings. So in honour of our current colours of Spring challenge that I am hosting my Snuggi has been paper pieced in nice pastel Spring colours. Has this ever happened to you? When I was almost done my card and was cutting out my image with a nestability the unthinkable occurred. My sweet Gilli had a dent in the paper right by her face! Apparently a paper scrap was stuck to the plates of my die cutting machine and totally dented it. AAAaaaHHHHhhh!!! After I sat in my chair spinning around and sweating for a few minutes I cut out a sentiment from the MME paper I used on my creation and used it to cover up the dent. Phew!!! I would love to hear your fave way to cover up mistakes and unplanned 'surprises' on your crafty creations. 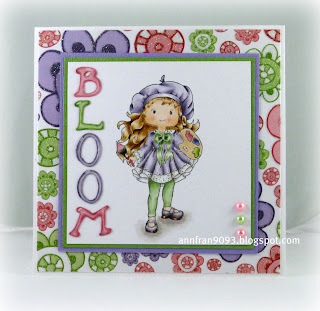 Please leave me a comment below and don't forget to make a card with Spring colours to play along with House of Gilli. We would love to have you! 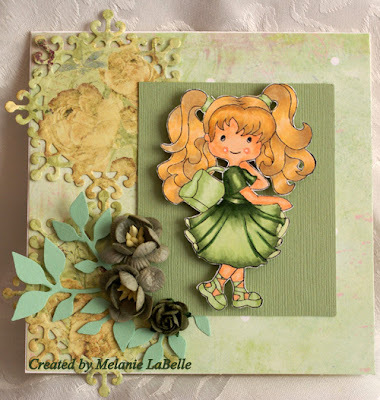 Vivi here and is my turn to bring a card for the spring colors challenge! I picked Shopper Gilli for the first time.. oh, she is so much fun to color!! I colored my image using copic markers V28, V25, V22, V20, G24, G23, YG03, E59, E47, E44, E40, E01, E00, R20, C3. I placed my Gilli in the standard and lacey nesties. Cardstocks are from Prima Flowers. Sentiment is from Spellbinders Matching Stamps – Favorite Elements set from StampingScrapping Designs. Flowers, Lace and Brads are from my stash. 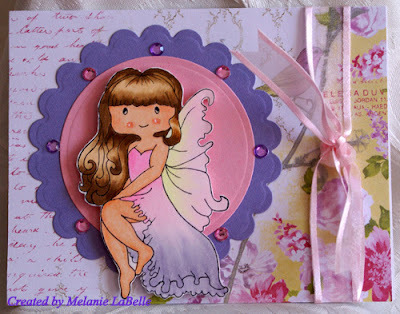 Hope you like my card and come on over to play along with us! Hello Everyone, Jo here today with another project for the Spring colors theme. This time I didn’t make a card but a little Easter basket to put some chocolate goodies in. I thought those little Hershey’s kisses with pastel colored foils would be cute. I have used Gilli Florist for my project today. She fit the bill perfect. With her spring flowers and little basket. This little basket is simple to make. 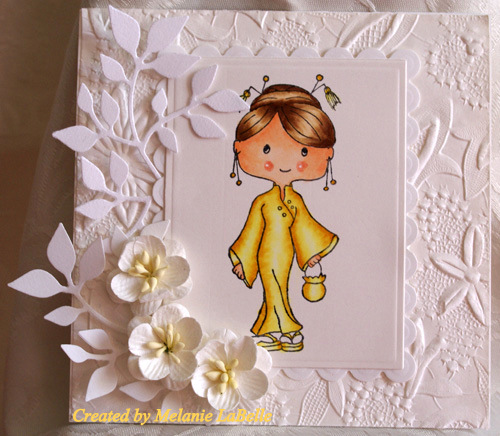 I have used a piece of 6 x 6 paper from Authentique Uncommon collection. Add a piece of satin ribbon with some brads to hold it all together. I have colored her with my Copics. I also used my new Cherry Lynne Grass die that I received as a gift from a good friend. I layered 3 on top of each other to give a little depth. The Happy Easter is from a Studio G set stamp with chalk ink. Chalk ink is the best ink for using clear stamps, gives really good coverage. I colored her shirt and then added white dots to make it a little different. I hope that my card has inspired you to join in on our challenge this time around here at The House of Gilli. Thanks for stopping by The House today. Lil Gilli Girly is great in Green! Andrea here! I had a bit of a creative holiday so it has been awhile since I have shared one of my Gilli creations. I am happy to say I am back after moving into a new house and ready to play along with our challenges here at House of Gilli! -I still can't find most of my stuff in my new crafting space at the new house LOL!!!!!! My lovely friends helped me unpack and now I just have to figure out where they put it all hee hee! I hope you get a chance to play along with us as well- we would love to have you join us! Happy Thursday everyone. Lovin' all the wonderful cards/projects for our challenge. You still have a few days left to enter. I colored Stroller Gilli with Copics and I think she looks cute all in green :) Remember to check us out every few days to see all the beautiful inspiration fromm the DT. Rockability GILLI in Green ! to shown a GILLI dressed in Green ! a Recipe card instead a regular card. Enjoy this Brazilian Drink known as "Caipirinha" ! Check more details on the recipe here at my BLOG ! Jo here today to share some inspiration for our theme this round. With our theme being Greens there are so many possibilities. Of course you have St. Patty’s Day right around the corner. Oh and then you have green grass which I am sure everyone is waiting to see soon. We would love to see what you come up with. Of course we would love to see you use a Gilli stamp. But if not that’s fine too we love to see your creativity. Gilli is here to paint the town green. I have used Gilli Painter to give us a hand with this. I decided to make and easel card. I have cut this with my lifestyles dies. I have colored Gilli with my copics. I have used part of a Cherry Lynn dies for the leafy swirl. The word image is one of Gilli’s stamps as well. I thought it worked well with Gilli Painter. For Gilli’s paints I used Liquid Pearls so that it would give it the look of real paints. I hope that my card has inspired you to join in on our challenge for this round. Show us your Green. Thanks for dropping by to have a look.